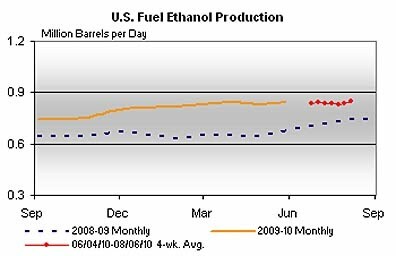 Before the Deepwater Horizon incident I would follow the EIA weekly announcements known as This Week in Petroleum and occasionally comment on what I thought to be important. 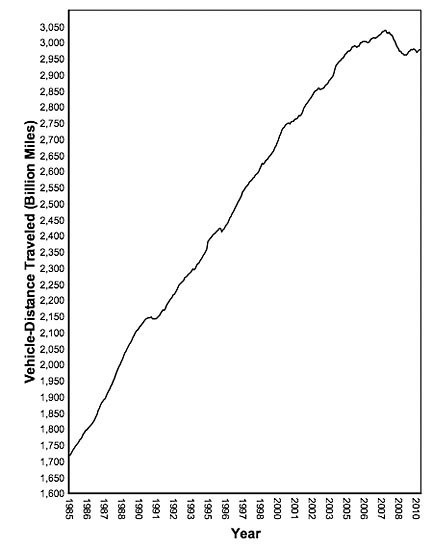 At the same time, trying to discern how the economy was improving, if at all, I would look at the data from the FHWA on the vehicle miles travelled, and include that each month. 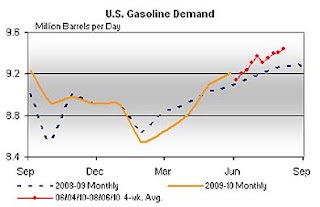 For a variety of reasons it looks as though I haven’t done that since February at which point the US demand for gasoline was falling below that of a year ago, inputs to refineries were below that for 2009, and the VMT (which appears three months later) were showing that November numbers were somewhat more positive. So with this 6-month hiatus, and being now towards the end of the summer driving season, how have things progressed? 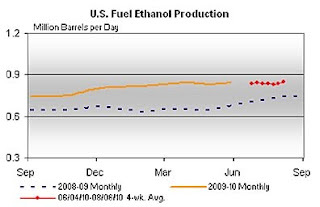 Just to see how it progresses over the next few months, as corn and grain prices may rise due to the problems, inter alia, in Russia I am going to add the ethanol production curve from TWIP to the mix I will look at. 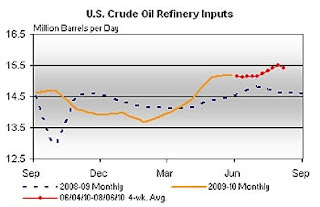 Gasoline comes from refineries, and looking at the input to those refineries, this has been increasing, relative to last year, though it may have peaked, a little later than last year, for this season. 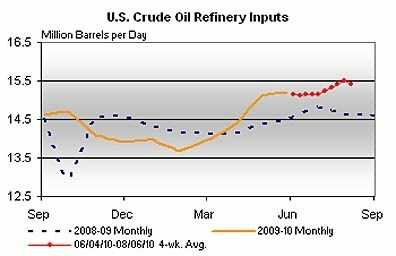 Domestic production of crude remains quite flat, and for the next couple of months may depend on how relatively calm the Hurricane season remains, remembering that it was predicted to be more severe than usual. Which means that the increase in demand must be met by increased foreign imports, which is what is being reported. 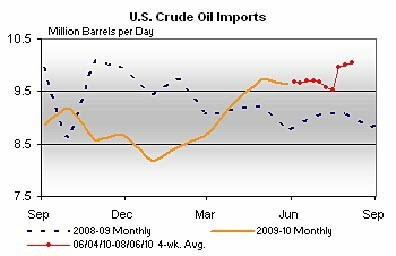 The increase in imports indicates that there is a growth in the economy that it is rising to meet, and this is recognized in the Short Term Energy Outlook that the EIA released yesterday. 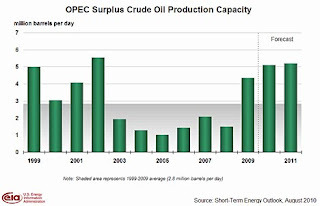 They anticipate that, overall, demand will rise by 140,000 bd this year, and by 170,000 bd next year. 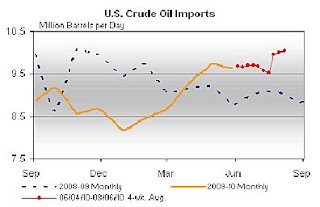 With the global economy also growing, the question arises as to where this oil will come from. 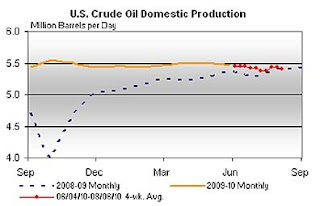 The EIA notes that while non-OPEC production is expected to rise by 0.72 mbd (million barrels a day) this year (based largely on increased production from the USA, Brazil and Azerbaijan) it will drop by 0.16 mdb next year (mainly due to falls in production in the North Sea and Mexico). Which, with an overall estimate of world demand growth being 1.6 mbd this year, and 1.5 mbd in 2011 raises the reasonable question as to where it is going to come from. 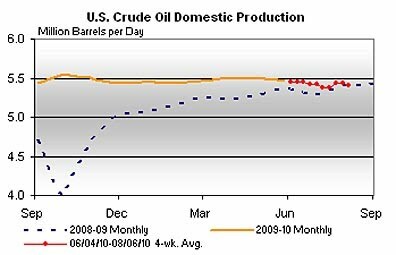 The only answer is OPEC (which, as I’ve mentioned before, is why it is their production which is now controlling the price of oil). 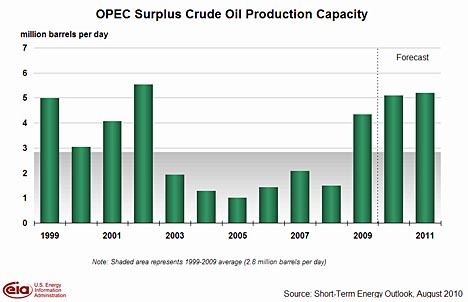 The EIA see their spare capacity as being around 5 mbd. I personally think this is about twice the real value, but that is a discussion for another day. (But if the growth rate continues for 3 more years it may well be consumed). So will growth rates be sustained? Well the main story at the front of the TWIP this week was on the rising demand for jet fuel, for the first time since 2007, and having just come from a total of 3 flights that were all “full to the gunwales” the demand for travel may be picking up. But if one goes back and looks at the VMT for May, that recovery that I was beginning to see in February, hasn’t continued through the Spring, but rather reached a plateau. We will have to wait a couple of months to see whether that number has picked up as well as the air travel. 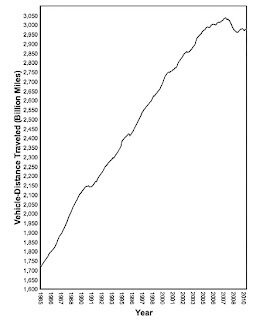 12-month rolling summary of vehicle miles travelled through May 2010 (FHWA).